You control a robot in a maze who must change the color of the circles in the center of the screen while avoiding monsters. Collect the Red and White Knights that walk around the maze to change your robot’s color. Match color patterns during the bonus rounds. This is a simple maze and puzzle game that can be quite challenging at times. 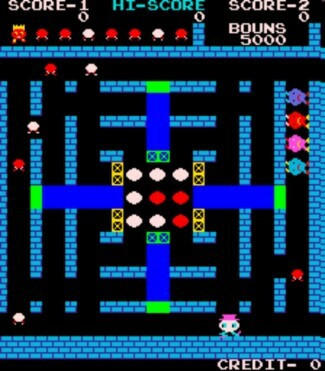 At the start of a maze level, your character must pick-up at least one Red Knight and cross the center of the screen where there is a three-by-three arrangement of white discs. As the player character touches one of the exterior discs, it displaces that disc and your character appears on the other side. Barriers to these discs only allow access at certain points and each time a discs is displaced, the barriers change positions. The maze portion of the game can be compared to a combination of Lock ‘n’ Chase and Make Trax. The puzzle round could be described as challenge of solving a 2-D Rubik’s Cube. The object of the game is to change the nine white circles in the middle of the maze to red. Push the joystick in any of the four directions to move your player character. Dodge the four enemies, known as the “Gly Boys”: Ghastly, Beastly, Homely, Deadly. Picking-up White and Red Knights will change your character to the Knight’s respective color while awarding you points. Collecting King Rompus will halt any of the currently roaming Gly Boys and make them harmless. A level is complete when all nine circles have been turned red. A timed bonus round follows where the player must arrange colored blocks to match a given pattern. Move the joystick right or left to choose a column or row and press the button to rotate those blocks (much like a Rubik’s Cube). Any number of puzzles can be completed as long as time remains. After time runs out, the player is presented with another maze containing nine white circles. The challenging part of the game is first chasing down and collecting a Red Knight. Your player character seems to repel knights so you will have to be clever to catch them. Once your character is red, though, you need to avoid collecting any White Knights until you cross the center. Avoiding the Gly Boys is troublesome enough, but you must also time your center crossing so that you allow yourself enough time to escape enemies on the other side. The puzzle game is simple enough to understand, but the time limit makes things much more frustrating.